I'm struggling to design a circuit that will interpret signals from a SCT013 current transformer and trigger a constant 5v signal (which will go to a microcontroller) when a certain current threshold is met. I thought I may be able to achieve this by taking the burdened AC signal from the CT and rectifying it with a bridge rectifier and smoothing capacitor. Then hook this up to the base of a transistor that will emit a 5v low current signal. I thought that by adjusting the value of R2 I would be able to have the transistor 'trigger' at different current levels. The choice of transistor was arbitrary, I just wanted to see if I could get the rectified signal to 'trigger' the transistor. The CT produces a current between 0 and 50ma, its ratio is 1:2000. 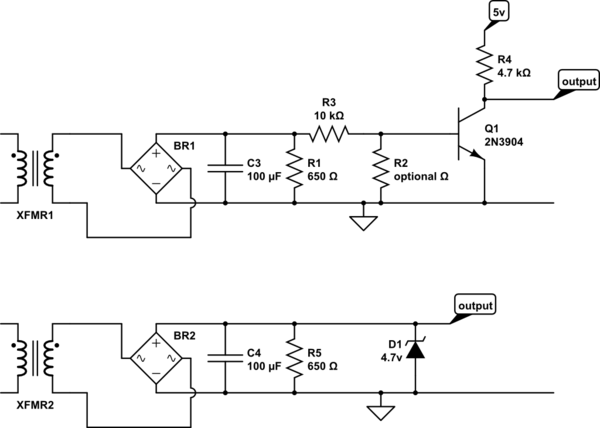 I would like the circuit to send a signal if the AC current is above 1 or 2 amps. When I test this circuit there seems to be some problem with tying the bridge rectifier to ground. I'm very new to circuit design and especially to using transistors, so I apologize in advance if this design is totally ridiculous. If it is, what would a more direct way be to achieve the same thing? I realize that I could hook the CT output up to a ADC on the microcontroller and just see if current is flowing that way. But I was interested in the challenge and I'd like to learn more about circuits and transistors. Not ridiculous, but a bit of a mess around the output transistor, and you've missed a trick with how to burden a current transformer. Together with the (good) isolation of the current transformer, there should not be any problem due to the way you've grounded the diode bridge, that bit is fine. Normally, when we use a transistor in this sort of trigger circuit, we use it in common emitter. R2 is optional, it allows another degree of freedom when selecting the trigger level, rather than adjusting R1. This circuit has a fairly well defined trigger level when the base voltage is at around 0.7v. An unloaded current transformer is a current output, so in this sort of circuit, we get far 'better' rectification by putting the burden after the rectifier, this removes almost all the diode forward drop from the output. For a cheap'n'cheerful circuit, with a rather more ragged threshold, I would tend to use the second circuit. The zener clamps the output voltage to be safe for the microcontroller's digital input, and the threshhold voltage is whatever poorly-defined level the microcontroller input uses. Of course if the zener of the second circuit fails open, you could fry the microcontroller, the first circuit requires multiple failures to do that, so you may find the first preferrable. Your capacitor value of 1uF is a bit puzzling, as together with the 650 ohm load, the time constant is way below one mains cycle, which will result in the circuit turning on and off 100 times per second. Perhaps this is what you want, in which case you could omit C1. If you want to stabilise the output, then C1 should be much larger as shown (or yet larger), though there will still be intermediate currents for which the output will chatter on and off at mains frequency. I'd recommend you use a -005 or -010 but it seems you probably already have a -000 which is 100 A full scale (for 50 mA output). Your second problem is that R2 in your schematic will not allow you to set a trigger level very accurately if at all. You need to research BJT amplifiers some more. If your CT is 50 mA RMS full scale, and if you want to output about 1 V RMS you can calculate what the desired burden is. Assuming you care little about linearity and can accept low accuracy you could increase the output voltage to say 10 V RMS full scale. This would need a burden resistor of about 200 Ohms. So for a -000 CT you'd get about 0.1 V RMS per Amp. This is clearly not enough to rectify with a bridge rectifier (even if it was Schottky diodes you'd be in trouble. You should do some reading here to help you understand the CT better. You could increase the sensitivity of a -000 by passing multiple turns through the CT. 4 loops would make it 25 A full scale, 5 loops would make it 20 A full scale. Using 4 loops and still with 200 Ohms burden, you now have about 0.4 V RMS or about 800 mV peak per Amp. Assuming that you don't care about linearity, you can rectify the output before the burden resistor ...but this really plays havoc with the scale linearity. Once the output is rectified it's best to clip the output, and I'd recommend you use something like a TL431 or 4.7 V Zener to protect the MCU DIO port. Not the answer you're looking for? Browse other questions tagged ac mains bridge-rectifier current-transformer current-sensing or ask your own question. Can I run a microcontroller on the power from a go-kart alternator?